Two men died in a tractor trailer crash in Charlotte, North Carolina on April 6 when their rig slammed into an overpass on I-85. The wreck happened at 4:30 AM a few miles northeast of uptown. The entire northbound side of I-85 had to be shut down for several hours. The deceased victims of the tractor trailer crash were identified as Christopher Dyer, 22, of Jonesboro, Ga., and Rodney Watson, 45, of Gulfport, Miss. Investigators say that Dyer lost control of the rig, which was operated by Swift Transportation out of Phoenix AZ. 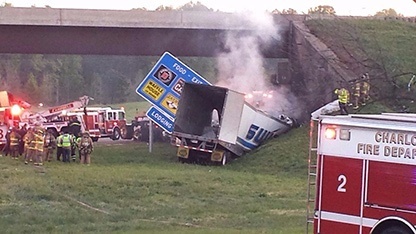 All of our truck crash lawyers in Virginia and North Carolina are saddened that this tractor trailer wreck occurred. While we do not know the cause at this time, we do know that the driver of the rig lost control. In many cases, this is due to either being distracted behind the wheel or falling asleep. Our CDL manual in Virginia stresses the importance of getting enough rest so that truck drivers are fit to drive. Driving at night is always riskier as all people are affected by the circadian rhythm. Even people who are experienced at working and driving all night will naturally have a low point of alertness from 2-6 am. It is very important to get proper rest when you are not driving. Also, the CDL manual notes that most truck crashes happen between 12 and 6 am. Whatever the relationship was between the two deceased truck drivers, the family of the passenger should look at filing a wrongful death lawsuit both against the estate of the driver and the trucking company. Wrongful death lawsuits in truck crashes can lead to very large verdicts or settlements, which can help the family to plan for a life without their primary breadwinner.